I've always loved the idea of getting together with friends and family for brunch - a leisurely, long meal packed with breakfasty goodies, eaten after sleeping in until 10. My mom tells me that her grandmother (in Nova Scotia) used to have people over for brunch every week after church. "They were poor people, but the baked bean pot was filled, tea biscuits made, teapot on (no coffee)," says Mom. "Probably eggs (from their own hens) and homemade condiments (beets, pickles, chow-chow). Oh yes! Always homemade bread." The coal stove kept everything warm as extended family and neighbours casually dropped in. Sounds like a beautiful way of building companionship and community, huh? I'm definitely not that industrious. I am not efficient enough at cooking for crowds to get a weekly gathering going. But a nice brunch for the family and a few friends now and then would be lovely. I recently received a copy of The Edgy Veg: 138 Carnivore-Approved Vegan Recipes . I was invited to share a couple of recipes with you and I settled on two fantastic brunch recipes - a vegan eggs benedict and a mimosa with a difference. Read on for the recipes, and enter to win a copy of the book. 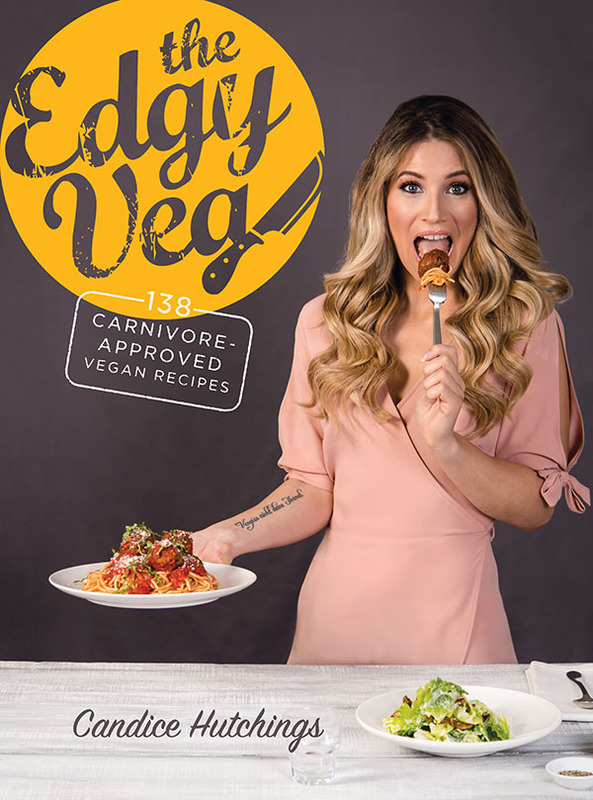 The Edgy Veg cookbook serves up vegan comfort food recipes created by popular (Toronto) YouTuber Candice Hutchings, who created the recipes for husband James Aita (as he transitioned from meat-eater to vegan), thus ensuring the recipes are carnivore-approved. When people think of vegan food, they often think of salads, smoothies and all things kale. And there's definitely a place for all those things in a well-rounded vegan diet. But Candice has chosen to re-purpose ("veganize" if you will) familiar family favourites such as pancakes, biscuits and gravy, fried chicken, cheese fondue and chocolate mousse. I made the "Literally Dying" Skillet Cookie à la Mode over the holidays, and let me tell you, this recipe doesn't skimp on the sugar (or the chocolate chips). It's a big cast-iron pan filled with a thick, delicious chocolate "cookie" for the whole family to enjoy. I didn't take a photo, probably because the family chipped away at the cookie in just one evening and it was mostly gone by breakfast the next day. The Edgy Veg cookbook features new recipes along with a selection of fan favourites. The book also lists vegan pantry staples, tools of the trade and suggestions for books to read and things to watch. From the introduction, "If we have to spend another day scrolling through our Instagram feed and seeing yet another pile of zucchini noodles or meticulously decorated acai bowl staring back at us, we're going to throw ourselves out the window. We're adults and we have needs. And these needs include, but are not limited to, a juicy burger, extra fries and a margarita to wash it all down." I like their thinking! The Edgy Veg has a section called "Become a Master of Seitan: Chicken," followed by "Seitan Mastery 2.0: Beef" and then "Neat Balls, Bro." Seitan is something I keep planning to make more of, ever since the packaged vegan "chicken" breasts and cutlets I used to rely on disappeared from Canadian grocery stores. I'm looking forward to making Candice's "Chick-Fillet Deluxe." The cookbook also has "Not-Boring Salads," munchies, desserts and a healthy dose of humour. The brunch chapter is subtitled "The Hangover Story" and the recipes are "designed to make you feel better about your choices from the night before while you recollect said activities with your closest confidantes." There are pancakes and loaded breakfast burritos and, of course, the lovely Veggs Benny recipe that you'll find below. Once you've got the Ritzy Hollandaise sauce at the ready, this recipe is easy peasy. Roast some asparagus, fry up some tofu slices, heat up the vegan cold cuts and throw it all on English muffins! It will pair beautifully with the Ginger Kombucha Mimosa. 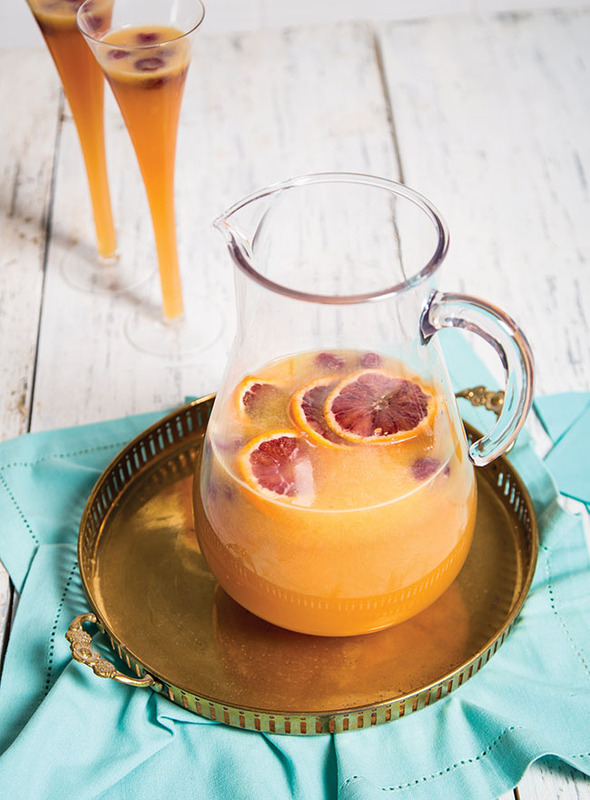 I love kombucha, so I also love the idea of combining it with fresh-squeezed orange juice, sparkling wine and fruit for a special brunch treat just for the adults. What about you? Are you a fan of brunch? How often do you enjoy it? At home or at a restaurant? With friends or alone? What plant-based goodies do you like to serve? In a large pitcher, combine orange juice and kombucha. Top with prosecco; stir to combine. Put 3 raspberries at bottom of each of 8 champagne flutes. Pour in kombucha mixture. Serve. We like this mimosa with ginger kombucha, but use any flavor of kombucha your heart desires. Try using different fruit juices and fresh fruit (like blood orange!) for new and exciting cocktail combinations. You can make any cocktail a health tonic by swapping out your traditional sugary mixer for flavored kombucha. In a large bowl, combine asparagus and olive oil; toss to coat. Arrange in a single layer on a prepared baking sheet, and roast in preheated oven for 10 to 15 minutes, until tender but still crisp. While your asparagus is roasting, heat coconut oil in a large skillet over medium-high heat. When oil begins to shimmer, add tofu and a pinch of salt and pepper. (Don’t be shy with the salt: tofu literally has no flavor, so salt with conviction!) Cook for 10 minutes on each side, flipping once, until tofu starts to brown on the edges, just like an egg would. Set aside. Heat the same pan you used to prepare the tofu over medium-high heat. Lightly fry cold cuts for about 3 minutes, flipping once, until heated and slightly crispy. Congratulations, you’ve just made vegan bacon! Place 2 English muffin pieces on each plate and top first with cold-cut bacon slices, then tofu egg, followed by asparagus spears. Drizzle with hollandaise sauce and add a sprinkle of cayenne and chopped chives. Serve immediately and say “So long” to that hangover! In a blender, combine almond milk, tofu, black salt, nutritional yeast, mustard powder and turmeric. Blend on High until smooth. Add lemon juice and blend until smooth. Add cayenne and pepper; pulse until well combined. Remove the plug in the lid. While the blender is running, slowly add vegan butter through the hole in the lid and blend until smooth. Check the taste and consistency of hollandaise and adjust salt, pepper and lemon juice, if necessary. 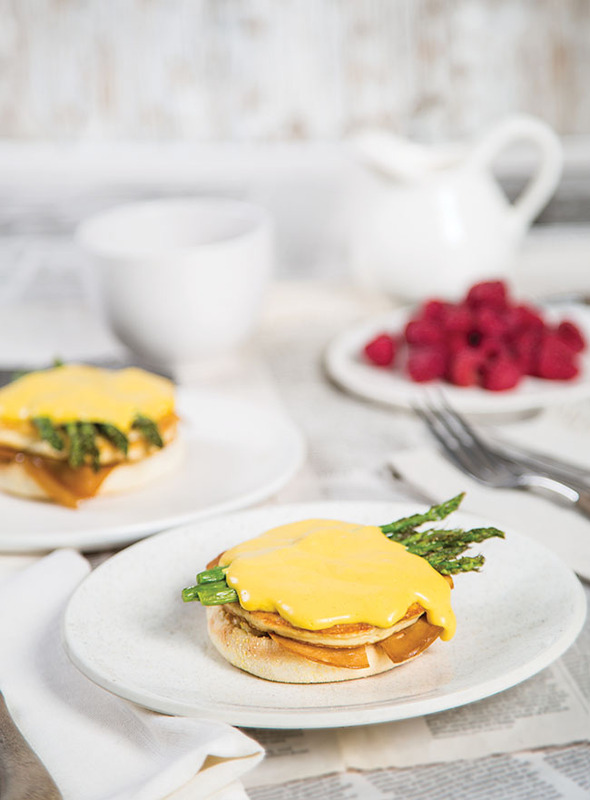 Hollandaise is a very versatile sauce; it’s stellar in our Veggs Benny (page 70), but also tastes fabulous on top of our Better Than Eggs: Tofu Scramble (page 36), in The All-Day Breakfast Sandwich (page 73), drizzled over veggies or even as a dip for Potatoes Served in the French Manner (page 224). Enter to Win a Copy of The Edgy Veg! Residents of Canada and the US may enter to win a copy of The Edgy Veg (courtesy of Robert Rose Books), using the rafflecopter widget below, until February 5th. Recipes and images courtesy of The Edgy Veg: 138 Carnivore-Approved Vegan Recipes by Candice Hutchings and James Aita © 2017 www.robertrose.ca Available where books are sold. Yum, I love tofu scrambles too! I enjoy brunch because it involves family, friends and good food! But it's been awhile since I've had brunch. I love brunch! Waffles are my favourite! I need to make more waffles! No worries Katie. Thank you! I love brunch. Love starting with a big fresh fruit salad and some freshly baked scones. Those Vegg Benny's look really good too. Your Ginger Kombucha Mimosa looks yummy! I love brunch! Lots of fresh fruit/berries/melon for toppings on waffles, pancakes & omelettes. My son is Vegan and he has been encouraging me to try different dishes as I have poor health due to Fibromyalgia. With this book I could surprise him with a full course meal we both could enjoy. Thanks for the contest chance. Brunch gives me life! I love to have some waffles and an adult milkshake! We love brunch especially on weekends when time is not a factor. We usually add spinach on our omelettes. I love brunch, and I love veggie omelettes! I love brunch, especially pancakes with blueberry sauce. I love brunch, I love Tofu Omelets! I like to make waffles on their own with a toppings bar, or do seitan & waffles, or a good tofu scramble with lots of toppings. Do I love brunch? It's the greatest meal ever invented. I always serve a combination of sweet breakfasty treats like French toast with strawberry syrup, and savoury bites like panzanella salad skewers. I love to have friends and family over for brunch. I serve fresh fruit and a fresh salad full of kale and cucumbers and dried berries and nuts. I do love brunch and I love crepes with it. I am not vegan, but my son is. I am looking for good ideas. I prefer brunch over breakfast and to me that means my appetite is open for anything. The Ginger Kombucha Mimosa sounds delicious and so does the Eggs Benny. I love brunch. I love to have smoothies and pancakes and fruit salad. I love brunch! Breakfast foods are my favorite and there are so many amazing vegan recipes that I enjoy sharing with my friends. We make tofu scramble, smoked tempeh, pancakes or muffins, and roasted potatoes - yum! These pictures are beautiful and are making me hungry! I think we might have to have brunch for dinner today! Love brunch. Pancakes/waffles and omelets filled with veggies are favourites.